Republican lawmakers with a history of proposing or passing civil service reforms applauded President Trump for his call to ease the firing of federal employees across government, saying they would fight to ensure the changes occur legislatively. In his State of the Union address to Congress on Tuesday night, Trump proposed expanding the authorities agency leaders have to fire problematic employees. The president cited as an example the Veterans Affairs Accountability and Whistleblower Protection Act he signed last year, which made it easier for the VA secretary to discipline employees and shortened the appeal process. “Tonight, I call on the Congress to empower every cabinet secretary with the authority to reward good workers, and to remove federal employees who undermine the public trust or fail the American people,” Trump said. Rep. Phil Roe, R-Tenn., who chairs the House Veterans Affairs Committee and helped usher the 2017 law through the lower chamber, said he was pleased with the progress VA is making in enacting the measure and wants to see the reforms extended across government. Sen. Johnny Isakson, R-Ga., Roe’s counterpart in the Senate who helped author a compromise version of the 2017 law, similarly said he would like to see the principles of the VA bill expanded. It would take more than a simple tweak to apply the language of the VA law to the rest of government, as it was in many ways crafted to address the specifics of the department. Some provisions of the law, for example, deal with the protections afforded specifically to VA’s health care workers and mission. Federal employees will not likely face an immediate push to fulfill Trump’s request. An aide to Republicans on the House Oversight and Government Reform Committee, from which any bill would likely generate or at least win initial approval, said there were no plans as of now to draft or bring up such a bill. 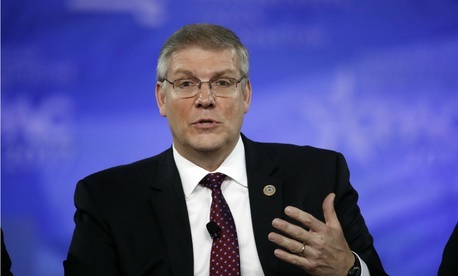 Rep. Barry Loudermilk, R-Ga., praised Trump for his comments and said his previously introduced measure—the Modern Employment Reform, Improvement, and Transformation (MERIT) Act (H.R. 559) would fulfill the president’s request. The bill would empower agency heads to fire any employee, provided they give a notice in writing. Employees would have seven days to appeal a removal to the Merit Systems Protection Board, which would in turn have 30 days to make a final decision. If it did not rule in time, the agency’s decision would stand. Employees would not receive any pay or benefits in that interim period. VA fired 2,537 employees in the one-year period from the time Trump took office last year through earlier this month. Public data on the department’s new accountability website show 1,455 removals, but VA said the figure reaches the higher total when coupled with probationary terminations. According to data maintained by the Office of Personnel Management, VA fired 2,662 employees for discipline or performance in fiscal 2016, the last fiscal year entirely under President Obama. A VA spokesman said the firings actually increased when comparing calendar years, citing internal data. As to Trump’s point that all of the firings targeted employees who failed to give veterans proper care, VA fired just 10 employees in medical records positions in 2017, 48 physicians or physician assistants and 308 nurses or nursing assistants. By comparison, it fired 177 employees in housekeeping and 82 in food services. To put that in perspective, VA fired one doctor for every 1,000 it employs, while it removed three nurses for every 1,000; four medical record technicians for every 1,000; and 10 food service workers for every 1,000. VA employed just 227 employees in housekeeping management as of September. The department fired one SES employee in fiscal 2016, compared to five (of the 138 it now employs) in fiscal 2017. The law allows the department’s secretary to fire, suspend or demote an employee with only 15 days' notice. Employees can appeal to the Merit Systems Protection Board in an expedited timeframe. MSPB then has 180 days to issue a decision, with the law designed to make it easier for VA to prove a negative personnel action was warranted. Employees would maintain the right to appeal an MSPB decision to federal court. Unionized and Senior Executive Service employees have distinct, internal grievance processes that have to be completed within 21 days. Some observers saw Trump’s proposal to expand that bill as a threat to the civil service system. J. David Cox, president of the American Federation of Government Employees, said front-line workers, hundreds of whom are themselves veterans, have become the victims of the new law. Cox said that hearing the president's proposal on such a high-profile stage, in conjunction with the policies over the last year, would hurt the morale of the workforce. Cox added his organization is still feeling out the full impact and fallout from the VA bill, but employees are already noting the change in the process for proving guilt. A provision of the measure has shifted the burden of proof necessary to defend negative personnel actions, which now requires a judge to uphold a department decision if it shows substantial evidence against the employee in question. Previous statute required VA to prove a majority of evidence supports its decision. Cox said that change, coupled with a push for more direct hiring, could upend the structure of the civil service.